The episode picks up immediately where we left off, with SG-1 stranded in deep space in an outmatched and damaged Ha’tak vessel and most likely about to be destroyed by Apophis’ flagship. The crew decide to attempt to parley with Apophis but the Goa’uld, who wants revenge for the destruction of his fleet, refuses all attempts at negotiation or surrender. The team are saved however when a more advanced ship starts attacking the flagship, allowing the woefully underequipped Ha’tak to retreat behind a nearby star to recuperate. While the Carters fix the systems Daniel and O’Neill talk about what happened to Teal’c, with O’Neill taking it out on himself for not anticipating an ambush while Daniel tries to alleviate his guilt. At the SGC, currently unaware of the situation regarding SG-1, a Tok’ra contingent arrive to discuss what has happened. The leader of the contingent inform Hammond about what happened regarding the supernova and that SG-1 haven’t made contact and are likely to have died in the process but Hammond isn’t ready to accept defeat just yet. Back on the Ha’tak the Carters find that the Hyperdrive can’t be repaired and their only shot is to see what happened in the fight between Apophis and the new ship. Flying out of the radiation field of the star they find that the other ship has disappeared and that Apophis flagship is emitting no life signs. Taking a gamble the team decide to try and nab the flagship, knowing that it’s way more advanced than the Ha’tak. O’Neill and the Carters arrive to find the self-destruct has been activated so Jacob/Selmak decides to try and shut it off at the control room while the two members of SG-1 scout the rest of control deck, both groups finding only dead Jaffa and a serious Replicator infestation. With no way to shut off the auto-destruct they make a retreat to the Ha’tak, managing to survive the blastwave by placing all power in the shields despite Jacob’s pessimism. Surviving the blast the team find they’re not the only survivors, detecting a Tel’tak on the sensors. Upon communication they find that Teal’c has survived along with a group of free Jaffa and need to dock. Upon arriving however Teal’c and the other Jaffa take them prisoner, revealing that Apophis survived and is leading a now loyal Teal’c in taking the Ha’tak. Upon placing the team in a holding cell Teal’c claims he’s always been a double agent, clearly having been subjected to brainwashing similar to his son Rya’c. Jacob, having avoided detection so far, is captured when he tries to release them from captivity. While the other Jaffa unload the Tel’tak, which includes a sarcophagus, it is revealed that at least one Replicator has hidden away in a crate. The Replicators soon grow to a large enough number to take over the engine room, seizing control from Apophis’ Jaffa and also inadvertently freeing the trapped team. Apophis attempts to evacuate but the Replicators have already made it to the control room, easily killing his Jaffa outside (as energy weapons have no effect), leaving his only option being to lock the doors and hope for the best, but the swarm soon breaks through. Elsewhere the team, having rearmed from supplies confiscated by the Jaffa, come into conflict with Teal’c and his group of Jaffa who they are forced to kill but manage to take Teal’c himself hostage after non-fatally wounding him. The team manage to get to the cargo bay where the Tel’tak landed but the Ha’tak suddenly goes to hyperspace. They find that the Replicators are using a heavily upgraded hyperdrive to create a foothold in the Milky Way on Apophis’ capital planet. With the Replicators in control of the ship their only shot is to destroy the engine room controls when it exits hyperspace, causing the ship to plunge in the destination planet’s atmosphere uncontrolled, destroying it in the process. The team is successful, barely managing to make it out before the ship falls into the planet, taking the Replicators and Apophis along with it. Teal’c, despite the death of Apophis, still believes himself a loyal servant and believes he will rise again. And here we have the final end of Apophis, closing out the original plotline of the show. Here the formerly dominant Goa’uld, who was previously vanquished only to rise again, is this time eliminated by a massive explosion after plummeting into a planet aboard a Ha’tak, never to rise again. The episode also brings back the Replicators to create a massive action—packed episode as the team not only have to deal with a brainwashed Teal’c but also unstoppable killer robots who make short work of the Goa’uld’s bodyguard. One of my favourite parts of the episode has to be how with so much serious matter on the table it instead chooses to go lighter with a focus on the rather childish arguments between O’Neill and Jacob/Selmak, largely over rank aboard the ship with O’Neill in particular not used to taking orders while out in the field. These antics end up with mocking each other’s mistakes during the adventure, such as O’Neill refusing to let go of Jacob saying ‘we’re not going to make it’ near the start of the episode. I also enjoy just how much work clearly went into working the Replicators believably into the story, especially during the later Ha’tak segments. What initially starts as a few quickly becomes a giant swarm and this is relayed to the viewer not just through the visuals but also through the background audio, such as being able to hear Replicators rattling around behind the walls during the climax of the episode as they literally take over every nook and cranny of the ship. The only thing that I feel was a bit bizarre for the episode was just how quickly Teal’c was brainwashed back into the service of Apophis given his previous history. It has only been a few hours since they last saw him but already he is the Gao’uld’s undying servant. Overall the episode remains a great one from the series, with memorable action sequences featuring both the Goa’uld and Replicators, and a satisfying and well-deserved end for the main villain up to this point, all bolstered by top notch audio and visual effects. · I really don’t get what Apophis’ plan was once the Replicators show up, basically hiding in the control room which they’d easily break into. · The Replicators don’t have replicate very bloody fast in this episode. We begin sometime after the team return to Earth. In the preceding time the on-base psychologist, Dr MacKenzie, has been attempting to deprogram Teal’c and believes to have finally succeeded with Teal’c claiming that Apophis was a false god. Bra’tac however, who has been brought to the base to help with the Teal’c situation, realises that Teal’c is still a believer in the Goa’uld and has him restrained in one of the observation labs. 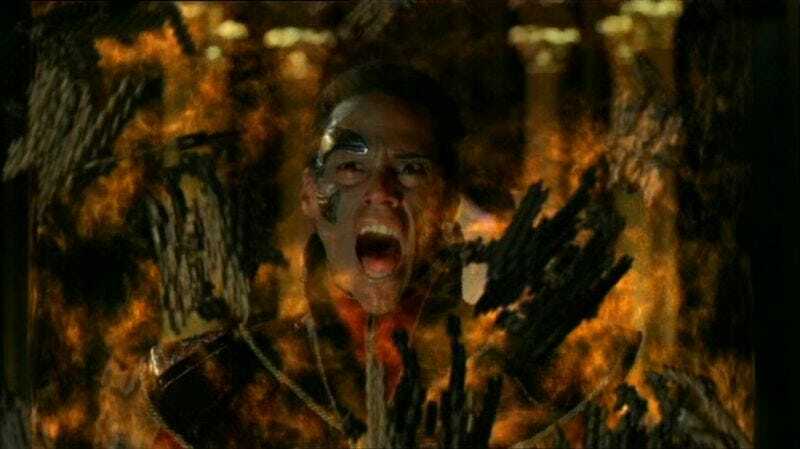 Bra’tac decides that there is only one method left to try and break the Goa’uld’s hold over Teal’c; removing his symbiote to induce a ‘life flashing before your eyes’ like state called the ‘Rite of M’al Sharran’ through which he’ll find the truth. Despite objections from both Hammond and Fraiser the Rite goes ahead, with Teal’c routinely fading in and out of consciousness. One of his first flashbacks is a meeting face to face with Apophis many years ago, who claims that Teal’c’s father was a coward for refusing to fight an unwinnable battle for which he was killed by Cronus. Despite this Apophis continues to take an interest in the young Jaffa, who has continued his training with Bra’ac, and eventually makes him his First Prime. Throughout his training however his views of the Goa’uld are continuously challenged by Bra’tac, who seeks to convince his apprentice of the truth of the Goa’uld. Though initially reluctant to change his view of them as gods Teal’c begins to see the truth after his friend Va’lar is sentenced to death for failing to win an impossible battle, with Teal’c to be the executioner. Rather than killing him he sends Va’lar away into exile and tells Apophis that Va’lar is dead, shocked when the Goa’uld believes him. Teal’c however is forced to later kill Va’lar and the village he hid in to cover up his earlier deception but still retains his doubt in the Goa’ud. Teal’c however continues to weaken without his symbiote to sustain him. Near death he finally comes full circle, arriving at the memories of the day of his rescue and subsequent defection to the Tau’ri in Children of the Gods. The medical staff barely reintroduce the symbiote and revive him in time for his survival where, upon returning to consciousness, is revealed to have chosen the truth and declares once again that Apophis is a false god, a dead false god. And here we the final part of the previous storyline, with the fixing of Teal’c after his brainwashing by Apophis in the previous episode. Most of the episode is largely designed to fill in more of Teal’c’s story before becoming First Prime which until his point had largely been only about his family alone. While they could’ve gone down the easy route of having Teal’c always be against the Goa’uld and Apophis they instead follow a much better, more nuanced approach to the subject matter. This features Teal’c, having been raised in a subservient environment, initially being a believer in the power and status of the Goa’uld as gods, willing to follow any command they give and commit heinous acts in the process. It is only with the influence of his mentor Bra’tac that he finally starts to question the real worth of Apophis. Even after the break of this belief system they also keep the realism intact, with Bra’tac pushing that while the Goa’uld aren’t gods they’re still powerful and that open rebellion is pointless. Instead their only option is to ‘play the game’ and use what latitude the position of First Prime gives to change orders to save as many lives as possible. This is one of the times the portrayal of the Jaffa struggle has been quite grey morally. Both Teal’c and Bra’tac accept that committing war crimes in the name of Apophis is a fact of life and that open questioning is likely to see an even more ruthless Jaffa placed as First Prime and at least this way they can control the level of carnage on the battlefield. Overall the episode is one that successfully expands Teal’c’s backstory and how he became First Prime in a believable way that acknowledges the moral and ethical sacrifices they were forced to make along the way. · Oh look, Tea’c’s wife showed up. Hard to remember she even exists with all the ex girlfriends of his who keep showing up.